Enough Koshar….I need some PIG!!! Last night was absolutely gorgeous out. A little windy, but otherwise Spring is here to stay. 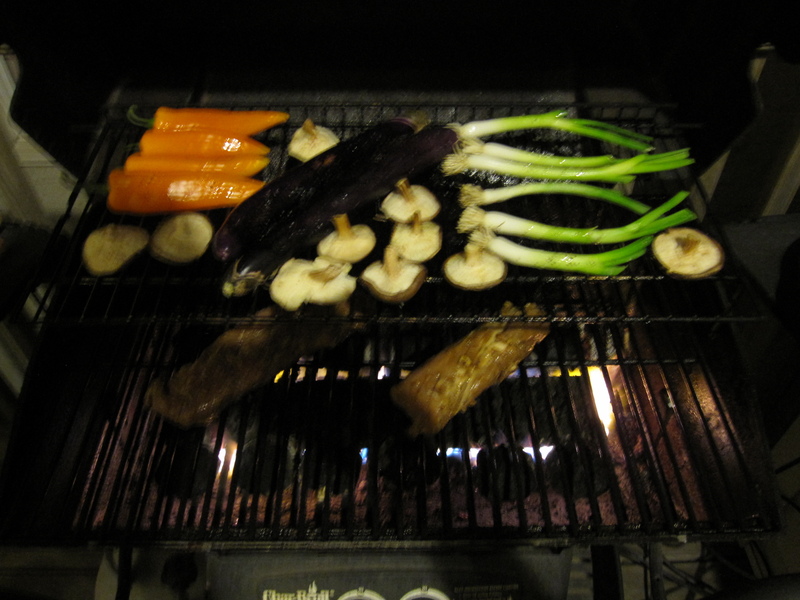 Combine the weather with two Passover Seders and I really had no choice but to grill up some sort of swine. I picked up some pork tenderloin for the occasion. I marinated it in a mix of 5 tablespoons of soy sauce, 3 tablespoons of sake, 3 tablespoons of cider vinegar, an inch of grated ginger, 4 grated garlic cloves, and 1 tablespoon of ground coriander seeds. I covered it and left it in the fridge for about 3 hours. For vegetables I took two whole Japanese eggplants, 4 orange sweet peppers, a bunch of fat green onions, and a bunch of fresh shiitake mushrooms. I simply drizzled them all with a little olive oil, salt, and pepper. You’ll see me do that a lot with the grill as I really don’t think you need to do anything when you have good fresh produce and a hot grill. Before grilling everything I took the marinated pork out of the fridge and let it rest to room temperature for about a half hour. I grilled it all up. 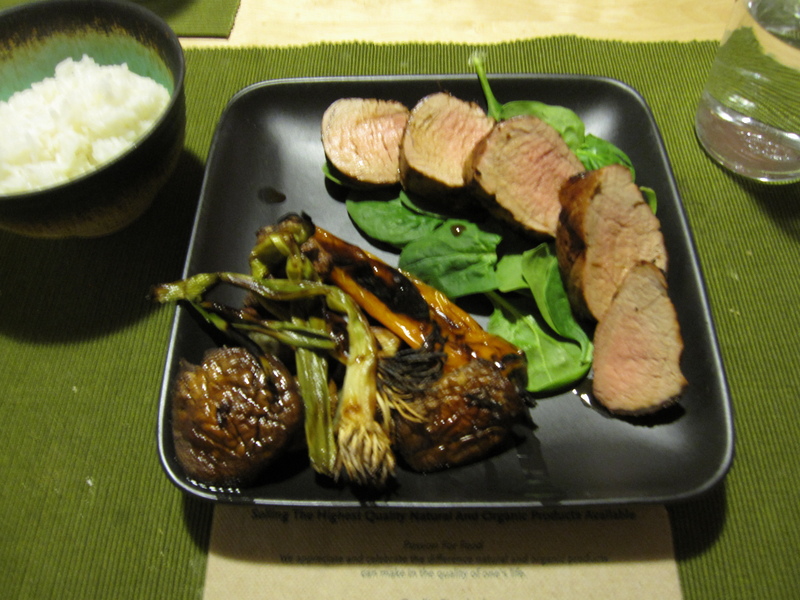 After letting the pork rest for about 10 minutes I sliced it and served on top of some fresh baby spinach with the grilled veggies and some white rice. When you have a good fresh tenderloin you shouldn’t cook it all the way through. I got this one at Whole Foods so I’m not overly concerned with getting sick or anything from it. Leave it a little pink and you’ll enjoy one of the greatest textures of flesh out there. You can’t beat a nice medium-medium rare pork tenderloin.